NVR (NVR) "Long-Term Review #14"
One of my weekend tasks that I like to try to accomplish has been to look way back into the early posts of this blog and see how they have turned out. Of course, just like my 'looking back one year' reviews, these assessments assume a buy and hold approach to my picks. In practice I advocate and employ a very disciplined, idiosyncratic process of selling stocks quickly on declines and slowly and partially on appreciation. This difference in managing a holding would of course affect the performance of any stock actually purchased. But for the ease of review, let's take a look at a pick from the 'early days' of this blog and see how the company and the stock is doing now! It is getting late in the session...I guess you could say it is long in the tooth and I need something better for all of you stock fans. Didn't see much on the NYSE or NASDAQ but on the Amex list we have one called NVR, Inc. According to Morningstar, NVR "builds single-family homes, condominiums, and townhouses, primarily in the Washington, D.C. area. The company builds about 3,000 homes per year ranging in price from $70,000 to $640,000 and averaging $182,000." NVR "also provides morgage financing through 23 offices in 15 states." A little bit of overlap with our New Century Financial I guess....but not much. Not a cheap price, but not at the Berkshire Hathaway level (! ), but today stock is trading at $394.86 (!) up $16.36 at 1:32 pm (CST) or a 4.32% increase. Driving this stock higher was the release on April 16th of the first quarter result ending March 31, 2003. They announced that total revenue increase to $743 million compared to $692.2 million last year, and earnings per share exceeded last year's result by 24%. Looking at the last 5 years, we find that revenue has grown from 1.5 billion in 1998, 2.0 billion in 1999, 2.3 billion in 2000, 2.6 billion in 2001, and 3.1 billion in 2002. Free cash flow, as reported in Morningstar, has grown from 189 million in 2000, to 149 million in 2001 (a decrease), then back up to 369 million in 2002. This company really generates money! Market cap is 2.7 billion, no dividend is paid, and the p/e is a rather cheap 10.94. Just the PRICE is high! (Just buy less shares). I do not own any shares of this company...but it looks like a nice investment to me! Happy investing and a Peaceful Memorial Day to all my friends! Bob"
Let's take a closer look at NVR today. NVR just posted their 3rd quarter 2007 results on October 19, 2007. For the quarter ended September 30, 2007, revenue declined (17)% to $1.29 billion, down from $1.55 billion in the prior year. Earnings for the quarter were $91.1 million or $15.26/diluted share, down 22% from $129.3 million or $19.63/diluted share. The company actually beat expectations on earnings which had been expected to come in at $11.97/share, but missed expectations on sales which were expected to be $1.32 billion. 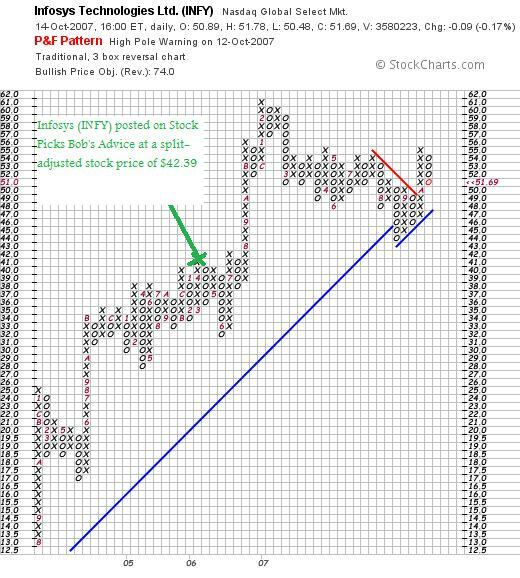 Looking at the 'point & figure' chart on NVR from StockCharts.com, we can see the wild ride this stock has had with the stock climbing sharply after the purchase to reach a high of $945 in July, 2005, only to start a gradual decline to the current levels. Thanks again for stopping by and visiting! If you have any comments or questions, please feel free to leave them on the blog or email me at bobsadviceforstocks@lycos.com. If you get a chance, be sure and visit my Stock Picks Podcast Site (where I need to post a new show soon! ), my Covestor Page which analyzes my actual stock holdings in my trading account, and my SocialPicks page where my stock picks are evaluated since the first of this year. Have a successful week trading everyone! As one of my weekend 'tasks' I like to go back into the archives of this blog and look at past stock picks. For the ease of analysis, this review assumes an equal $ purchase of these stocks and a 'buy and hold' strategy after their purchase. In fact, I advocate and practice a very disciplined investment strategy that requires me to sell stocks quickly and completely on losses, and slowly and partially on targeted appreciation levels. This difference in strategy would certainly affect any actual performance and this should be taken into consideration when considering this review. My last 'review' was last weekend when I reviewed the picks from the week of April 17, 2006. Let's go ahead a week and take a look at stocks picked during the week of April 24, 2006. On April 26, 2006, I posted Lamson & Sessions (LMS) on Stock Picks Bob's Advice when the stock was trading at $25.90. LMS closed at $27.20 on October 19, 2007, for a gain of $1.30 or 5.0% since the 'pick'. On August 12, 2007, it was announced that Lamson & Sessions would be acquired by Thomas & Betts (TNB) for $27/share. 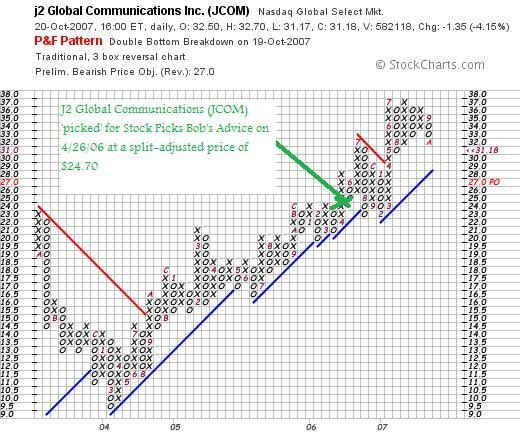 On April 26, 2006, I 'picked' J2 Global Communications (JCOM) for Stock Picks Bob's Advice when the stock was trading at $49.40. JCOM had a 2:1 stock split on May 25, 2006, making my effective stock pick price actually $24.70. JCOM closed at $31.18 on October 19, 2007, for a gain of $6.48 or 26.2% since posting. On August 6, 2007, JCOM reported 2nd quarter 2007 results. Revenue for the quarter ended June 30, 2007, increased 22% to $54.0 million from $44.3 million last year. Net earnings increased 29% to $17.1 million from $13.2 million or up 27% to $.33/diluted share from $.26/diluted share last year. The company beat expectations on earnings at $.36/share, when analysts were expecting $.35/share. Revenue at $54.0 million was a little light of the revenue of $54.3 million expected. The Morningstar.com "5-Yr Restated" financials are intact. 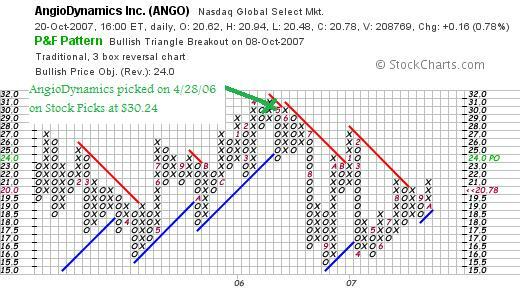 Finally, on April 28, 2006, I posted AngioDynamics (ANGO) on Stock Picks Bob's Advice when the stock was trading at $30.24. ANGO closed at $20.76 on October 19, 2007, for a loss of $(9.48) or (31.3)% since posting. Looking at the 'point & figure' chart on AngioDynamics from StockCharts.com, we can see the sideways move of this stock which has recently shown some strength breaking through resistance lines. 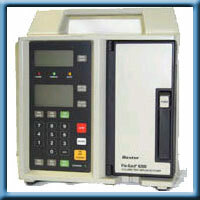 On October 1, 2007, AngioDynamics (ANGO) reported 1st quarter 2008 results. For the quarter ended August 31, 2007, sales came in at $37.5 million an 85% increase over the $20.3 million reported in the prior year. Net income grew 25% to $2.4 million from $1.9 million. However, GAAP earnings per share actually decreased 17% to $.10/share from $.12/share attributed to the dilution of earnings related to the January, 2007 acquision of RITA Medical Systems. The Morningstar.com "5-Yr Restated" is fair with strong revenue growth but earnings turning negative and free cash flow dropping to $-0- in the TTM. The balance sheet is solid. So how did I do with these three stocks from last year? With one stock with a small gain and the two others cancelling each other out with a moderate gain and a moderate loss, the overall average was a little bit negative at (.03)% since purchase. Essentially it was a wash! Anyhow, thanks for visiting! I hope you find my continued reviews helpful. I am concerned about the health of the market but shall continue to implement my trading and portfolio management and let my own stocks talk to me and tell me what I need to do! If you have any comments or questions, please feel free to leave them on the blog or email me at bobsadviceforstocks@lycos.com. If you get a chance, drop by and visit my Stock Picks Podcast website, my Covestor Page which reviews my actual trading portfolio, and my SocialPicks page which has begun summarizing all of my picks since January, 2007. Have a wonderful Saturday evening and a good Sunday! On Dealing With Market Corrections! It was a lousy day in the market. The Dow closed down (366.94) points to 13,522.02 and the NASDAQ was off (74.15) at 2,725.16. The S&P was off (39.45) at 1,500.63. What is an investor to do? I took big losses in my portfolio as well. I didn't miss the correction. I am not smarter than the market and I get hurt when the market hurts. What I do try to do is to manage my portfolio by selling some of my holdings when times are good and limiting my losses when times are bad. As an investor, it has been helpful for me to have a clear idea of when I need to sell shares both on the upside and on the downside. Successful portfolio management must include some sort of disciplined process of stock selection. I have my criteria; I am sure you have yours. After that, it is just as important to have some strategy at limiting your losses on the downside. I use an (8)% loss limit after an initial purchase; you might wish to use some other limit. But it is wise to know exactly when you are going to sell a stock after an initial purchase. I also move up these loss limits after the stock moves higher and reaches sale points on the upside. The exact process isn't as important as the strategy of limiting losses and preserving gains. Both are elements for success. In addition, while some may suggest it is wise to 'average up', that is to buy more shares of your strongest stock. I take a more conservative approach to investing, by insisting on selling small portions of my holdings as they appreciate. Combined with limiting losses, preserving gains by these sales may be helpful in improving your chances for profits. The other big element may be the issue of timing. I believe in an investing barometer of my own stock holdings. What I mean by that strange phrase is that is important to sense the tone of the market to determine if it is a good idea or not to be committing funds. I am not a value investor as such. I do not get more interested in buying new stocks as values improve and stock prices plunge. I am interested in determining when the market is exhibiting a healthy trading environment before jumping in with a new investment. I do this by listening to my own portfolio. I believe in a limited number of positions in a given trader's portfolio. For me, twenty is 'plenty'. My maximum is 20. My neutral position is 1/2 of that or 10. My minimum is 1/2 of that or 5 positions. My goal is to avoid compounding losses by resisting the impulse to buy something else after a sale on a loss. I avoid this, by requiring my portfolio to generate a 'buy signal' before replacing a recently sold position on the downside. That buy signal is generated by another holding that generates a partial sale by reaching a price target on the upside. That way, after a sale, I am directed to 'sit on my hands' with the proceeds. And I continue to do this sale after sale, if needed, until such time as the market tone improves and one of my holdings hits its targeted appreciation level on the upside. I cannot predict the market tomorrow or next week. But I do listen to my holdings. And they have much to say! I do reserve the right to make my own arbitrary decisions based on new technical or fundamental data on the company whose stock I own. But most time when I exercise this disgression, I wish I had simply listened to my stocks and their price movements. These signals generate the stock barometer I utilize. This automatically moves me towards cash or towards equities. It isn't a quick barometer and requires significant moves in my holdings; but it represents some sort of rational effort to time the market with an emotional investor like myself providing the direction. Will all this work? I don't know. I still lose money on bad days like today. But instead of a panic, I can check my stock prices, see that nothing needs to be done, and sit on my hands waiting for better prices. If the prices continue to drop next week, additional holdings of mine will be sold. But it won't be my arbitrary decision, which might even be wiser, but rather the stock price movement itself that shall determine my trading decisions. On a down day like today, it is nice to talke a little about philosophy. I certainly don't have any great new stocks to discuss at the moment! Please excuse my recent political digression. But I plan to share with you thoughts on other things besides stocks from time to time when I am so inspired. I look forward to your comments and responses! We certainly will not all agree about all things but I would encourage you to all provide links and supports to arguments. That is the wonder of the web. As regular readers here probably know, I like to look for new names for stocks which thus become part of my "vocabulary" of investing. When the time is right, being familiar with many 'acceptable' names is helpful in determining where to invest your money! My first step in identifying a new name is to check the list of top % gainers. This list of top % gainers often has names that may, I hope, move on to even higher levels. Certainly, just making a big move isn't enough to guarantee anything--but if we can identify those stocks moving higher that also have strong fundamentals, this is my basic thesis behind my investing strategy--perhaps we can develop portfolios of these kinds of stocks. "...is a diversified medical products and services company. It provides medical devices, pharmaceuticals, and biotechnology for the treatment of hemophilia, immune disorders, cancer, infectious diseases, kidney disease, and trauma worldwide." As is so often the case on this blog, it was the announcement of earnings today that led to the big move in the Baxter stock. 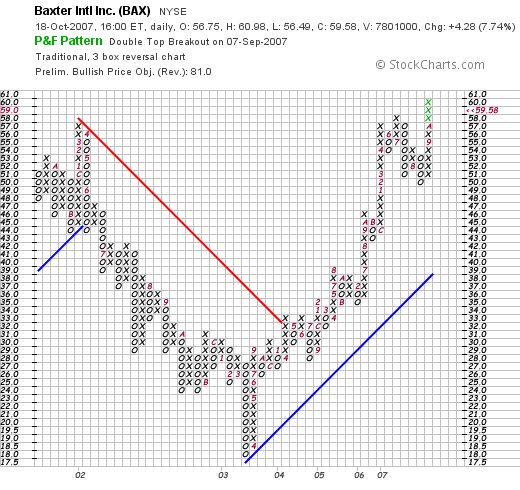 In fact, prior to the opening of trading today, Baxter (BAX) announced 3rd quarter 2007 results. For the quarter ended September 30, 2007, climbed 8% to $2.8 billion. Net income came in at $395 million, up 65 from $374 million in the same quarter in 2006. On a per diluted share basis, earnings were up 7% to $.61/share, from $.57/share last year. Even though an 8% or a 7% increase in anything might not appear significant, it was the fact that the company beat expectations that moved the stock higher today! According to analysts surveyed by Thomson Financial, BAX was expected to come in at $.66/share (the company came in at $.70/share before one-time charges), on revenue of $2.68 billion (they came in at $2.8 billion). To top off this nice earnings result, the company went ahead and raised guidance, now guiding to $2.75 to $2.77 in 2007, up from prior guidance of $2.65 to $2.70/share. My search for stocks is not for a company that has a great quarter and moves higher from that event. But rather for companies that can consistently produce positive and improving financial results. This is my definition of quality in terms of growth stocks. For this information, I have been utilizing the Morningstar.com data. The Morningstar.com "5-Yr Restated" financials for Baxter International (BAX) are strong. Since 2002, the company has increased revenue from $8.1 billion to $10.4 billion in 2006 and $10.8 billion in the trailing twelve months (TTM). Earnings did dip from $1.40/share in 2003 to $.60/share in 2004. However, since 2004, they have been increasing---coming in at $1.50/share in 2005, $2.10/share in 2006 and $2.50/share in the TTM. During this same time dividends have been paid--$.60/share from 2002 through 2006 and increased to $1.10/share in the TTM. The outstanding shares have been relatively stable, increasing from 599 million shares in 2003 to 650 million in the TTM. Free cash flow has been positive, strong, and growing. $822 million in 2004, $1.1 billion in 2005 and $1.7 billion in 2006. This has resulted in a solid balance sheet with $7.2 billion of total current assets compared to $3.8 billion in current liabilities. This results in a current ratio of 2.06. The company has an additional $4.2 billion in long-term liabilities. I am not purely a momentum player. I also like to review technicals in a simple fashion as well as some basic value questions. Using Yahoo "Key Statistics" on BAX, we can see that the Market Cap is a Large Cap sized $38.41 billion. The trailing p/e is a moderate 23.94. The '5-Yr expected' PEG works out to an acceptable 1.58. In terms of the Price/Sales (TTM), according to the Fidelity.com eresearch website, BAX is reasonably priced with a ratio of 3.32 compared to the industry average of 5.33. Besides being a good value relative to sales, the Fidelity.com website also suggests that the company is more profitable than its peers with a Return on Equity (TTM) of 25.34%, compared to the industry average of 19.33%. As I noted, the company pays a forward dividend of $.67/share yielding 1.20%. The last stock split was a 2:1 split in May, 2001. Examining the 'point & figure' chart on BAX from StockCharts.com, we can see that the stock traded lower from $58/share in March, 2002, to a low of $18/share in March, 2003. The stock subsequently steadily moved higher to the current level of $59.58. The stock chart actually appears quite strong for the past 4 years. Needless to say, I like this stock. It is a large cap growth stock with relatively modest but steady growth in revenue, earnings, and free cash flow. They beat expectations and raised guidance. They pay a dividend, have a reasonable Price/sales and a strong Return on Equity. They even have a product I understand and that I believe should be relatively recession-resistant. Diversified medical supplies. If I were buying a stock today, this is they type of stock I would be buying. Meanwhile, it is back into my 'vocabulary of stocks' along with the many other stocks on this blog. If you still have some time left, consider stopping by and visiting Prosper.com. If you sign up with Prosper before the end of the year, you shall receive $25 credit (and I shall also receive a credit if you go through this link). Be careful with this lending site and be aware of the extensive risks associated even with small parts of unsecured loans. However, this person-to-person lending program is rather amazing and the fact that it is combined in an Ebay fashion in a more or less Dutch Auction, is also a kick! Thanks again for visiting! Hope you have a profitable week and a wonderful weekend! Apogee (APOG) and Zumiez (ZUMZ) "Trading Transparency"
One of my strong beliefs in managing a portfolio is that we establish trading rules and stick by them. One of my rules is to sell any new purchase of stock should it hit or pass an 8% loss. By this, I mean to accomplish a couple of things--first limiting my losses so that no 8% loss becomes a 50% loss, and also, to allow me to star 'pulling in my horns' so to speak in the face of a weak market. In this case, my first stocks often to be sold are my latest purchases. Stocks which I may be terribly enthusiastic about, and yet were evidently purchased at exactly the wrong time. With that in mind, I sold two of my recent purchase, both stocks that I feel are great stories and worthy of consideration at a future date. I sold my 280 shares of Apogee (APOG) at $25.12, and my 105 shares of Zumiez (ZUMZ) at $48.24. My Apogee shares were purchased as recently as October 1, 2007, at a cost basis of $27.57. Thus, I had a loss on Apogee of $(2.45) or (8.9)% since purchase just a couple of weeks ago! Does this mean that I don't think these are great companies and possibly terrific investments? No, not at all. But my investing strategy requires me to sell stocks when they incur small losses. This may mean this is a result of just a small patch of volatility and that I just wasn't lucky. However, it may also be suggestive of a deeper correction, as my portfolio moves out of recently purchased stocks into cash. Thanks again for stopping by and visiting! If you have any comments or questions, please feel free to leave them on the blog or email me at bobsadviceforstocks@lycos.com. If you can, visit my Stock Picks Podcast Website, where I discuss some of the many stocks I write about here on the blog. In addition, drop by and check out my SocialPicks page where my stock picks have been and continue to be analyzed since the first of the year. To find out how my portfolio has been performing compared to some other active investors, visit Covestor and check their analysis. If you still have time :), and are interested in another area of investing, explore the Prosper.com page where if you sign up before the end of the year, both you and I can receive a cash incentive for your lending or borrowing. This person-to-person lending website may well represent very significant risks, so use caution. Spread out your risk. And start slowly! Hello Friends! Thanks so much for stopping by and visiting my blog, Stock Picks Bob's Advice! I will not give you the usual investment advice warning, because this entry is not about investment advice. It is about my thoughts on politics in America today, a subject I have chosen not to write about in the past. But a subject that I also hold close to my heart and a subject which moves me greatly. I do not expect most or even many of you to agree with most or any of what I have to say. But as a blogger, it is difficult to always wear my financial hat without sharing with you opinions and ideas about the world as well. Both of my hats fit me well. I welcome your comments and your thoughts on adding such editorial comment to this blog. It is often assumed that one who is interested in investing and the stock market must necessarily be conservative. This isn't always the case. It is also possible to care about profits as well as caring about the well-being of employees as well as their bosses. We can also be concerned about the shareholders as well as the profit margin of the corporation. We can care about free cash flow as well as free speech. We can care about the balance sheet as well as balance in our news media. We can care about global markets as well as global warming. I love the United States deeply. And yet I am concerned about the direction a few in Washington have been taking her. America is a nation that has historically been slow to enter wars, but when America goes to war it goes with a vengeance. We certainly have not been a nation to initiate wars; nor should we ever move in that direction. We have been misled by group of men who chose to create the facts to justify their arguments about war. While needing to be firm in the fight over terrorism, we also cannot afford to be nation-building both from the financial and human cost it involves. We have been successful in removing the corrupt leadership in Iraq. Now it is time for us to separate from that nation; turning the reins of power back to the people in that nation. America is a nation of equals. A democratic dream. A nation of laws. And yet we have leaders who ignore Congress and defy its laws in the name of an expansion of Executive power. This is not an America I recognize. We do not have a royal executive, we have an individual American who is chosen by the people to lead them, not as a monarch, but as a democratically elected President bound to uphold the laws of this land and the Constitution. And yet we now have an executive who defies the role of Congress, obstructs testimony, and loses millions of pertinent emails. We have an Administration that outs CIA agents as a sort of punishment when cooperation isn't forthcoming in doing their dirty deeds. This isn't the America I grew up with. When I was in high school, I read about torture in other countries. I remember the appeals from Amnesty International about, as I recall, torture going on in Central American nations. I learned about the Russian use of Gulags in College when reading Solzhenitsyn. But all of this was about something bad happening by some other country somewhere else. We have a President who believes he can make torture go away if he just defines it that way. Who believes that Extraordinary Rendition is a State Secret and the Supreme Court can't hear the facts. That Abu Ghraib was an aberration even though the Attorney General called the Geneva Conventions "quaint". This isn't the America I understand. Government isn't evil. We don't need to privatize everything because government does it badly. Private contractors have been employed in every aspect of government and these overpaid workers have failed us repeatedly. They have failed us at Walter Reed. They have failed us in Iraq. No, government isn't evil. It is us. We have government for the people, by the people and of the people. We don't all need to be shrunk down to the size that we can all be drowned in a bathtub. This isn't the America I love. Taxes aren't evil. Taxes are the things we pay that allow us to have the best government in the world. The best educational system. The best healthcare system. The best military. And the best roads and utilities in the World. This at least was what I understood taxes to be. This government which runs out country literally hates itself. It cuts taxes irresponsibly running up massive deficits and burdening our children for generations to come. This isn't the America I want to see. This nation supports science. We support education. We protect the environment. And yet we have leaders in office who undermine scientific investigation, deny the existence of man-caused global warming, censor scientists from talking about Polar Bears, or simply revise global warming reports before taking jobs with Big Oil. Our no child left behind program undermines instead of supporting public education. The end-game of NCLB is the failure of every school to reach standards that are raised indefinitely, leading to the draining of funds from public schools into non-tested schools of faith. This isn't what education is about in America. I could talk longer. But I have said enough. I hope you all are not upset that I have an opinion about the world that we live in. America is a land of possibility. Let us restore leadership to this nation that can dream of the possible and not wallow in the self-hate of the anti-government fanatics. Cutting taxes without cutting spending is no tax cut at all. 'There aint no such thing as a free lunch' I learned in college. Deficits are taxes. Remember that. And dead people don't pay taxes. Heirs and Heiresses do. And there is nothing wrong with taxing estates in a redistributive effort. Wealth is not going away in America. No, instead of disappearing, wealth continues to be more and more concentrated among the highest earneers. The poor get poorer and the rich richer. The way it always has been. But not the way it should be in America! Bring America back to me. Bring back the belief in the future the avoidance of fear, and the confidence to face challenges in the future. America can and will do better. I love it too much to think otherwise. It is still the weekend for a few more hours and there is time for me to review picks from about a year ago. Last week I reviewed the stock picks from the week of April 10, 2006. Moving ahead a week, let's look at stock picks from the week of April 17, 2006. As I have pointed out mutilple times previously, this review assumes a 'buy and hold' approach to investing, assuming an equal $ amount was invested in each of the 'picks' and performance is based on that assumption. In reality I practice and advocate a very disciplined portfolio management system that requires me to sell losing stocks quickly and completely and appreciating stocks slowly and partially. This difference in strategies would certainly affect performance and should be taken into consideration. On April 17, 2006, I posted Infosys (INFY) on Stock Picks Bob's Advice when the stock was trading at $84.78. INFY had a 2:1 stock split on July 18, 2006, making my effective 'pick price' actually $42.39. Infosys closed at $51.69 on October 12, 2007, giving my pick an effective gain of $9.30 or 21.9% since posting. On October 11, 2007, Infosys (INFY) reported 2nd quarter 2008 earnings results. Revenues came in at $1.02 billion, up 37% from the prior quarter last year. Earnings per American Depositary Share (ADS) climbed 33% to $.48/share from $.36/share. Due to the strength in the rupee and the weakness in the dollar, management forecast margins being hit by 50 to 100 basis points. The company beat its own guidance, but the stock dipped on the reduced guidance going forward. 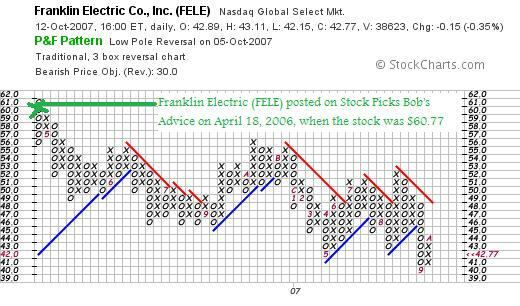 On April 18, 2006, I posted Franklin Electric (FELE) on Stock Picks Bob's Advice when the stock was trading at $60.77. Franklin closed at $42.77 on October 12, 2007 for a loss of $(18) or (29.6)% since posting. On July 30, 2007, Franklin Electric (FELE) reported 2nd quarter 2007 results. Sales for the quarter ended June 30, 2007, came in at $152.5 million, up slightly from the same quarter last year when sales came in at $152.2 million. Net income, however, came in sharply lower at $6.6 million down sharply from $16.4 million last year. Diluted earnings per share dropped (60)% to $.28/share, from last year's $.70/share in the same period. The company missed expectations by a wide margin, as analysts polled by Thomson Financial were expecting earnings of $.51/share on revenue of $162.5 million. Checking the Morningstar.com "5-Yr Restated" financials, we can see that not only have earnings dipped on flat revenue but that free cash flow which was positive came in at a negative $(13) million in the TTM. The rest of the morningstar.com page looks solid. 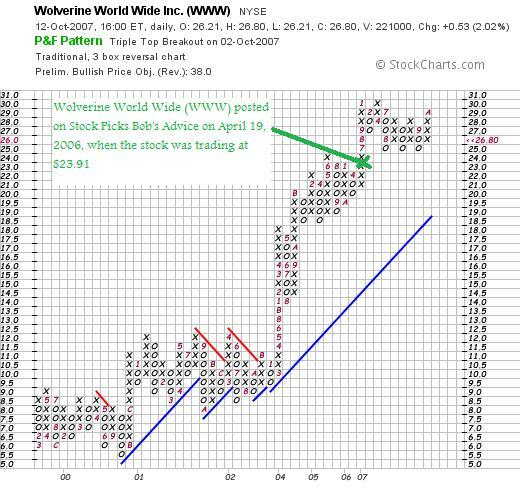 Finally, on April 19, 2006, I posted Wolverine World Wide (WWW) on Stock Picks Bob's Advice when the stock was trading at $23.91. WWW closed at $26.80 on October 12, 2007, for a gain of $2.89 or 12.1% since being posted. On October 3, 2007, Wolverine World Wide (WWW) announced 3rd quarter 2007 results. Revenue for the quarter ended September 8, 2007, came in at $310.2 million, up 3.8% over 3rd quarter 2006 results. Earnings for the quarter came in at $.54/share, up 17.4% from the $.46/share reported last year. The company beat expectations on earnings expected by analysts according to Thomson Financial to come in at $.53/share. However, the revenue figure underwhelmed the street at $310.2 million while analysts were expecting an average of $316.9 million. The company also raised guidance from $1.60 to $1.64/share for 2007 to new estimates of $1.63 to $1.65/share. So how did I do with these three stock picks? Well one had a loss, and the other two gains, the average performance coming in at a gain of a meager 1.47% since posting! Thanks so much for dropping by! If you have any comments or questions, please feel free to leave them on the blog or email me at bobsadviceforstocks@lycos.com. If you get a chance, drop by and visit my Stock Picks Podcast Website, my Covestor Page where my trading portfolio is actively tracked, and my SocialPicks page which has been following my picks since the first of the year! Zumiez (ZUMZ) "Revisiting a Stock Pick"
I first wrote up Zumiez on September 16, 2006, when the stock was trading at $26.24. As I pointed out, I did purchase some shares for my son's account (less than 50), but today's purchase is my first entry into this stock. Let me try to briefly explain my rationale for buying shares of this retailer in an otherwise weak retail environment, when given the choice of a new position with my own partial sale of my Cerner stock. "Zumiez Inc (NasdaqGS:ZUMZ - News), which specializes snowboarding and skateboarding equipment and apparel and was sheltered in part by geography and its casual product mix, reported a 13.9 percent rise in September sales at its stores open at least a year." 13.9% is a phenomenal figure. And the stock took off to the upside on opening today. However, later in the day, the stock, along with other retail shares, sold off...leaving me with a purchase a couple of $'s in the red. Not helping the situation was a downgrade today from 'Buy' to 'Hold'! As my regular readers know, I regularly check the latest quarterly report for basic results. In this case, Zumiez announced 2nd quarter 2007 results on August 22, 2007. Net sales for the quarter ended August 4, 2007, climbed by 47.0% to $82 million. Net income for the quarter was up even a greater percentage at $3.1 million, or $.11/diluted share, from $1.6 million or $.06/diluted share last year. This was an an 83.3% increase in earnings! "Comparable store sales increased 11.6% for the second quarter of fiscal 2007 compared to a 12.6% increase in the second quarter of fiscal 2006." Thus, this double-digit same store sales increase was present in the first quarter of 2007 as well as the first quarter of 2006! This company is on a roll! In addition, the company beat expectations of $.08/share on revenue of $80 million for the quarter. This was a great earnings announcement! The '5-Yr Restated' Financials on Morningstar.com are intact and impressive with steady revenue and earnings growth, stable outstanding shares, positive free cash flow and a solid balance sheet. Looking at Yahoo "Key Statistics" on Zumiez, we find that the stock is a mid cap stock with a market cap of $1.45 billion. The trailing p/e is very rich at 64.01, yet the growth is strong enough that the PEG is only slightly rich at 1.59 from my perspective. There are 28.69 million shares outstanding with 15.27 million float. There are 6.05 million shares out short representing 6.7 trading days of volume, or 33.10% of the float. This is more than my '3 day rule' and should be taken into consideration. No cash dividend is paid and the last stock split was a 2:1 split on April 20, 2006. Checking the Fidelity.com eresearch website, we can also see the rich valuation with a Price/Sales (TTM) of 3.86 compared to the industry average of 0.97. The company has a Return on Equity (TTM) of 20.96% compared to the industry average of 26.08%. Thus both of these statistics show relatively rich valuation. If we examine a "point & figure" chart on Zumiez (ZUMZ) from StockCharts.com, we see a chart of amazing price strength going back into 2005. 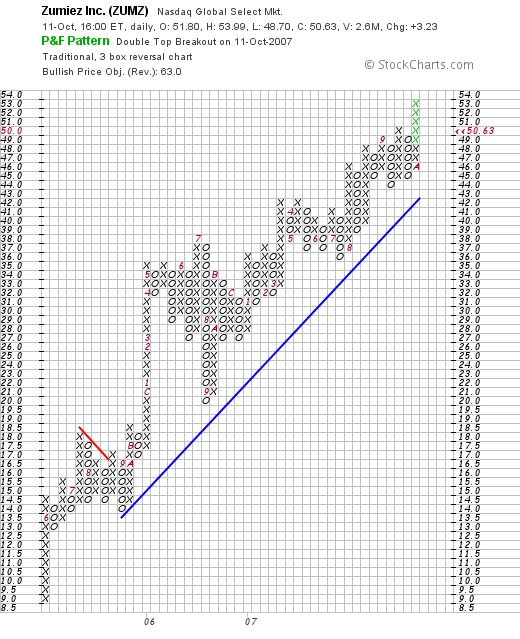 The current pullback does not appear significant enough to change the trend. I liked this stock last year enough to buy some shares for my son. This year, with the opportunity arising with the sale of a portion of my shares of Cerner (CERN), I chose to add this stock to my Trading Portfolio. My timing today left a bit to be desired as the retail stocks pulled back sharply late in the day. However, the numbers underlying this stock's performance have not diminished and are just as impressive. In particular, I am enthralled with the 13.8% same store sales growth number. In addition, they did the same kind of growth in the latest quarter and also did it a year ago! This company is on a sales roll! The latest quarter was great as the company beat expectations for both revenue and earnings and also raised guidance. Valuation wise, the p/e is very expensive, but the rapid growth expected to continue brings down the PEG into a reasonable estimated level. Other valuation numbers are also steep including the Price/Sales and the Return on Equity which is a bit weak relative to other companies in the same Industrial Group. There are lots of shares out short giving any correction possible support, and giving any rally in the price, additional energy. 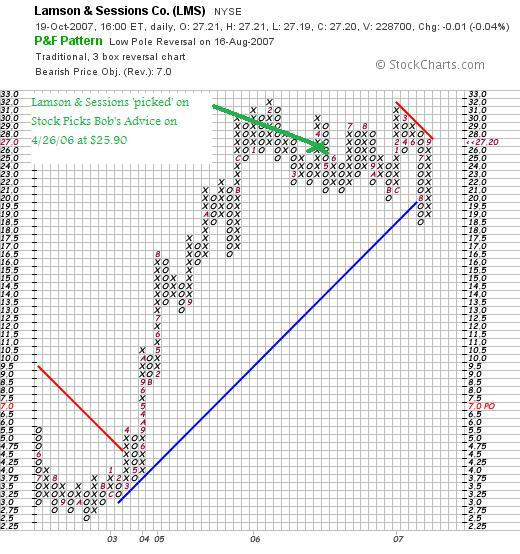 The chart looks great, and the company has a certain amount of "Peter Lynch" to its attractiveness. Anyhow, that's my call---and I liked the stock well enough to buy some shares! Thanks again for stopping by and visiting my blog. If you have any comments or questions, please feel free to leave them on the blog or email me at bobsadviceforstocks@lycos.com. If you get a chance, be sure and visit my Stock Picks Podcast site, my Covestor page where my portfolio is analyzed, and my SocialPicks page where all of my picks from this year going forward have been reviewed. Earlier today I wrote about my partial sale of Cerner at a gain. Let me give you the details now that I have a minute to write about it. These shares were originally purchased 2/2/07 at a cost basis of $49.76. I sold 17 shares, or 1/7th of my 120 shares, at $64.84 this morning. (They closed lower than this!). This represented a gain of $15.08 or 30.3% since purchase. The 30% level is my first targeted sale point. I went ahead and sold the shares and then with the permission slip (being under my maximum of 20 positions), went ahead and purchased 105 shares of ZUMZ. More about THAT later. Anyhow, that's a wrap. If you have any comments or questions, please feel free to leave them on the blog or email me at bobsadviceforstocks@lycos.com. Cerner (CERN) and Zumiez (ZUMZ) "Trading Transparency"
Quick post: Sold 1/7th of Cerner (CERN) (15 shares) at 30% gain and initiated a position in Zumiez (ZUMZ) (105 shares). Details to follow.